Meal is one of enjoyment of travel. Our normal stay plan is B&B. Because, we hope that you can easy choice where you eat dinner . Of course , we can prepare to delicious dinner for you for 1300 JPY . Our normal dinner menu is Jingisukan which is a Japanese grilled lamb dish prepared on a convex metal skillet ( It is like Mongolian plate BBQ) and iti is the No,1 Hokkaido local food ! In genearl , Jingisukan is served with lamb . 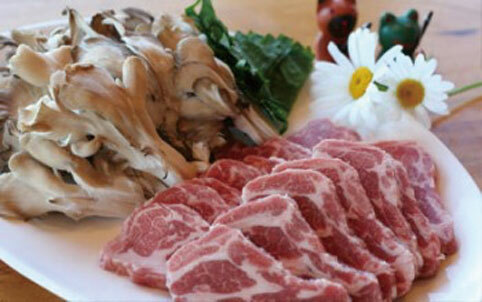 If you don`t eat lamb, Jingisukan is in general use lamb, don`t worry because the lamb we use has no offensive smell. However if you really cannot accept lamb,you can change to prok. (Remakrds: We don`t provide chicken and beef for Jingisukan). If you have two people , you can also order one lamb and one pork. At the time you fill in a reservation form, you can choices the type of meat. ※The dinner menu is for children over elementary school, but we children menu too. ※We probide some seasonal dishes beside our menu too. breakfastYou can enjoy wheat bread made in Hokkaido, with salad,potato, fruit ,yogurt and drink. 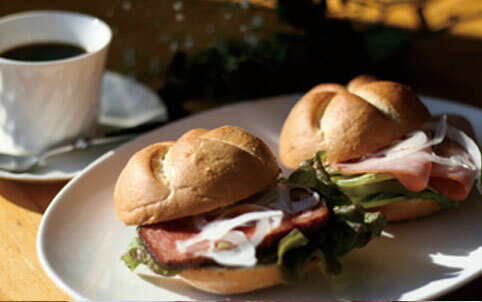 We have different menus every day so you can enjoy different types of food during your consecutive stays. Please enjoy our fresh and delicious Hokkaido seasonal ingredients. Our dinner time is available from 6:00 pm to 7:00 pm . ( Sorry we cannot provide dinner if you are going to arrive after 7:30pm） Our breakfast time form 7:00 am to 8:00 am. Please inform us when you would like to have meals upon arrival.